"I felt like if I was able to get a life jacket I could've saved my babies," Tia Coleman, who lost three children and other family members, said. A woman who lost nine members of her family in a duck boat accident in Missouri that killed 17 people said she believes her children could have been saved if she could have grabbed life preservers, and recounted the harrowing details of her escape. 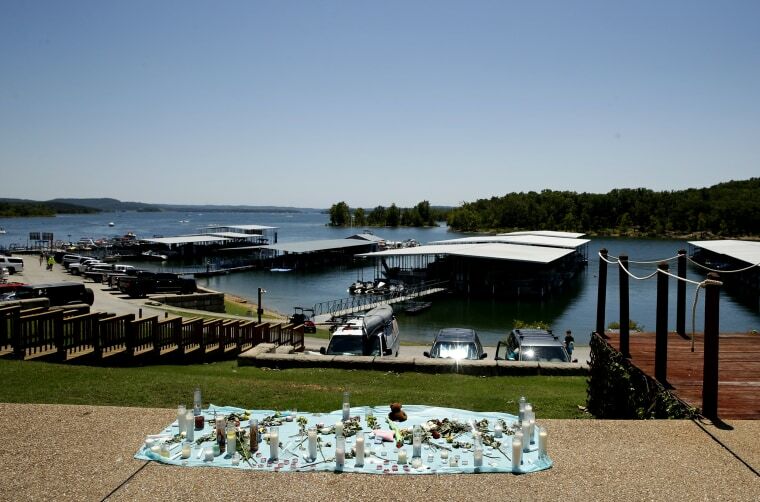 Tia Coleman’s husband, Glenn, and their three children — 1-year-old Arya, Evan, 7, and Reece, 9 — died after the duck boat on Table Rock Lake near Branson capsized in rough weather on Thursday and sank. A total of nine members of her family perished. "When that water came over the boat I didn’t know what happened,” Coleman, of Indiana, said at a press conference at a hospital on Saturday. "I had my son next to me. But when the water filled up the boat ... I couldn’t feel anybody, I couldn’t see. I just remember, 'I've got to get out, I've got to get out.'" Coleman said she hit her head on part of the boat, and the water was ice-cold, and she knew she was near the bottom of the lake. "As I was swimming up I was praying, ‘Lord, please let me get to my babies, I’ve got to get to my babies." The National Transportation Safety Board is investigating the accident, which occurred when the Ride the Ducks boat encountered trouble amid thunderstorms at around 7 p.m. local time (8 p.m. ET) Thursday. NTSB Member Earl Weener said Saturday that winds were clocked at 73 mph, just two miles short of hurricane-force winds, and waves were 4 feet at the time. Coleman said in a previous interview with FOX59 that during the trip the captain told passengers where the life jackets were, but said they would not be needed. "The biggest thing that stood out to me is, no matter what, I felt like if I was able to get a life jacket I could've saved my babies," Coleman said Saturday. "Because they could've at least floated up to the top, and somebody could have grabbed them. And I wasn’t able to do that." When she reached the surface, battered by waves, she said people on a showboat nearby were jumping into the water saving people. Weener said Friday that employees from the showboat jumped in the water to save some survivors. "They were, oh my God, jumping in saving people, they were throwing life rafts to everybody," Coleman said. She said somehow she was able to reach the boat. "But I believe I survived by God and by good Samaritans," she said. Coleman’s nephew was the only other member of the family on board that survived. Weener, the NTSB member, said Saturday that a chief question will be when exactly the boat's operators knew about the surprise storm and how they responded to the information. U.S. Coast Guard officials said the operator, Ride the Ducks Branson, voluntarily halted its lake tours as the inquiry proceeds. Investigators have retrieved a video recorder from the duck boat that sank and it’s been sent to Washington for analysis, and they’ve also retrieved video from the second duck boat that was on the water at the same time. Weener said the owner of Ride the Ducks Branson, Ripley Entertainment, has been cooperating fully with the investigation. There were 29 passengers and two crew members aboard the boat that sank, Weener has said. Sixteen passengers and one crew member died in the accident. Angela Coleman, 45; Belinda Coleman, 69; Ervin Coleman, 76; Glenn Coleman, 40; Horace Coleman, 70; and 1-year-old Arya Coleman; Maxwell Coleman, 2; Evan Coleman, 7; and Reece Coleman, 9, lost their lives. Also killed in the accident were William Asher, 69; Rosemarie Hamann, 68; Janice Bright, 63; William Bright, 65; Leslie Dennison, 64; Bob Williams, 73; Steve Smith, 53; and Lance Smith, 15, according to the sheriff's office. Coleman said she’s never been through something this difficult. "I don't know if there's a recovery from it," she said. She said she’s been getting through the tragedy with a lot of prayers, and thanked the support of family members and friends. "Going home, I already know, is going to be completely difficult. I don’t know how I’m going to do it," Coleman said. "Since I’ve had a home, it’s always been filled with little feet and laughter, and my husband." "I don’t know how I'm going to do it," she said.